Today we learned that Andy’s friend, Abby Judge, lost her battle with SMA. 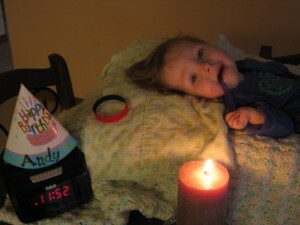 A brave fighter, Abby was 21 months old. I have been e-mailing her mom, Laurie, just this week about the realities that we face when confronted by this disease, the memories we cling to, and the hope that we must keep in our hearts. We reminisced about how we met – in the ICU of All Children’s Hospital during the last week of May, 2009. Abby and Andy both had been admitted within days of each other, both sick with pneumonia. One thing I know for certain is that when Andy looked at Laurie, he knew that he was looking at a friend. And, I remember liking Laurie instantly and feeling so grateful that I finally knew someone who really understood what it was like to be on this journey with Type 1 SMA. I went over to visit Abby later in her room and vividly remember how enthralled she was in her Strawberry Shortcake video. She had no time to chat with me! But, when her mom talked, Abby’s face just filled with love. I won’t ever forget that look in Abby’s eyes or the way that Laurie reached through the tubes and wires to lovingly stroke her hair. Unfortunately for us, Andy would never leave the hospital. The night that he died, we heard that Abby was struggling too. We were so afraid that we would lose her. But, thankfully, Abby made it home to her little pink room with her mom and dad the very next day. We like to think that Andy helped her find the strength to breathe without the machines and to leave the hospital safely. In the months that followed, I visited Abby, Laurie and Steven at home a few times…always met with a smile from Abby and the sound of Strawberry Shortcake on the TV. I got to hold Abby in my arms and marvel at how big she had grown. I loved her little pig tails. I listened to her say “mama” and watched in awe as she moved her arms to play with her toys. I read her a Strawberry Shortcake story, and she followed along intently, helping me turn the pages. And, on our first Christmas without Andy, Abby gave us a little tree with an ornament that she had hand-painted for her friend. It was the only Christmas decoration in our house last year, and it helped us to find happiness through our grief. Abby’s gift truly was from one angel on earth to another in heaven. Today, I am hoping that Andy was again with Abby, meeting her at the pearly gates. I can picture him with a huge smile for her – just like the one that he had for her mom so many months ago. I hope that he took her hand and introduced her to all of the other angels. And, I hope that they started to play like they never could on earth. I can just see them running and laughing, with Abby’s pig tails swinging in the breeze. But, I also know the pain that faces her parents, and I hope my friends know that we are here for them – with open arms and open hearts – for the next part of their journey. Steven and Laurie, we love you, and we thank you for sharing Abby with us. She lives forever in our hearts. I’m sorry to hear of Abby’s passing her family, friends, and loved ones are in our prayers.